Russell Davies does lots of things that are interesting, including, um, Interesting and Newspaper Club and a bunch of other stuff, but the other week he did a talk at the Playful event in London, culminating in this fabulous mock-up of an augmented reality game using an iPhone. SAP from russelldavies on Vimeo. 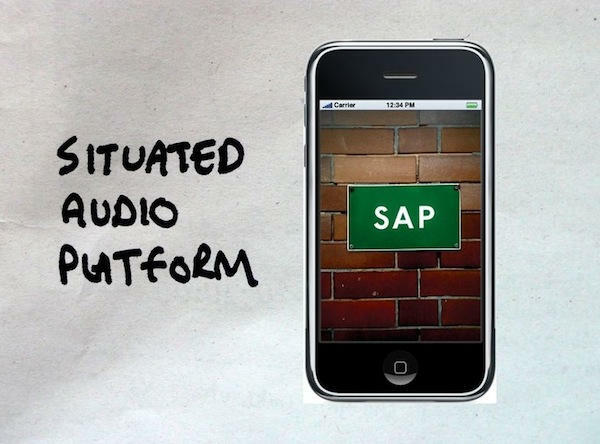 It’s called Situated Audio Platform, or SAP. It’s augmented reality based on sound; a virtual world wrapped round our existing one, but one you listen to, not one you have to watch on screen. Russell’s example shows interactions like finding hidden virtual objects, or destroying nearby virtual baddies. Think about it for a moment: suddenly you’re not just playing a game, you’re inside the game. It happens around you while you’re ambling down the street to the shops, or hanging out in the park on a Sunday afternoon. a racing element where the iPhone detects several players standing within a few feet to one another, and instructs all of them to run to a point 200 feet away, ready steady GO! I’ll leave you to read Russell’s full post to get a proper idea of what he’s trying to say. It’s well worth 10 minutes of your time.